Rain early. Decreasing clouds overnight. Low near 40F. Winds light and variable. Chance of rain 90%. SCOTT COUNTY, Ind. (WDRB) -- Indiana State Police say two men were found dead in Scott County. According to police, the men's bodies were found at a mobile home at the Scott Villa Mobile Home Trailer on West Lake Road in Scottsburg. 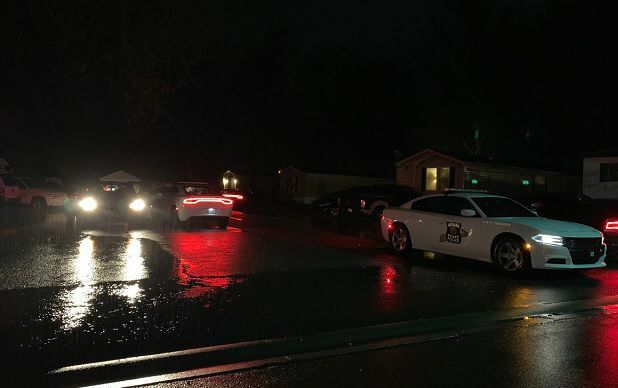 Police say just after midnight on Sunday, Scottsburg Police requested assistance from Indiana State Police on a call about shots fired at the mobile home park. Officials say shortly before midnight, another call was received by Scott County authorities. Police say the caller, 29-year-old Michael Jones, said he owned a mobile home and that he had shot a man who was trying to enter his residence. Authorities say the man shot by Jones was 34-year-old Larry Marlowe, who died at the scene. But Marlowe's family has a very different version of events. They say he came to the home to pick up his girlfriend. "She was at Michael Jones getting tattoos done," said Marlowe's mother Michelle. "Which is my son's supposed girlfriend. Well Jones, she was playing him and my son. She knew my son was there to pick her up. When he arrived there, he knocked on the door and (Jones) point blank shot him in the face." Detectives say it's still unclear what exactly transpired between Marlowe and Jones. ISP says Jones shot and killed himself some time after he made the 911 call. Marlowe's family questions why Jones would have done that if he was breaking into the house. "All that's a lie. That's bogus. That's a lie, period," Marlowe's mother said. Neighbors were evacuated from their homes while the Indiana State Police Emergency Response Team responded. After getting a search warrant, officers entered Jones' trailer and found him dead from a self-inflicted gunshot wound.